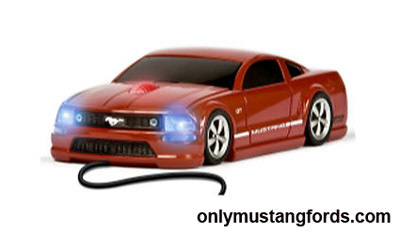 Here's just the perfect present for the Mustang fanatic, a Ford Mustang Mouse. It's a high quality wireless optical mouse, shaped like the new Mustang. This Ford Mustang GT replica, comes in a slick bright red exterior with matching white stripes and side lettering. One of the cool things about this computer mouse, are the little LED headlights that power up when it's on. Styled after the 2010 and newer pony cars, this awesome little Ford Mustang GT replica, looks as good as it works. And along with that classic Ford Mustang styling, the Ford Mustang Mouse includes a smooth scroll wheel and easy attachment. And just like the Dearborn ponycar, with it's standard equipment, high optical quality 800 dpi resolution, you are assured of accuracy and precise functioning making this Mustang computer mouse as good in action as it looks on your desk top. Have you always wanted your very own Ford Mustang equipped with a set of those classic 1960's and 70's style racing stripes? 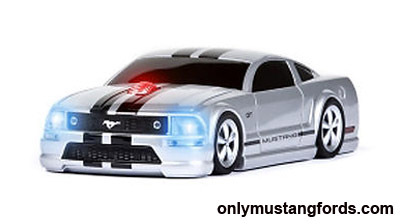 Then this Mustang GT Wireless Mouse could be just what you are looking for. Yeah, you could get a bland, off white cheapie plastic computer mouse that looks like an Easter egg that went flat, but wouldn't you rather use something that looks great and makes the start of some great conversations? Should you order Your Ford Mustang Mouse now? Just like the original pony cars, they make these only for a limited time, so they can follow the changes in styles for the model years. That means that this style won't be around for ever. So if you've been thinking about getting some soon, you might want to jump on it now, before it becomes someone else's treat!